Mystical signs inlaid with gold bedeck the magnificent hilt of the Langeid sword – a Viking weapon infused with Christian symbolism and laid in a pre-Christian grave while the new faith was conquering the last regions of Norway. The sword from grave 8 at Langeid in Setesdal valley is 91 cm long, almost completely preserved. There is only a few centimetres missing from the tip of the blade. Museum number C58882/3. Photo: Vegard Vike, Museum of Cultural History, UiO. We have a large number of swords from Viking burial sites in Norway, perhaps as many as 3000. Of these, fewer than half have hilts that are decorated with precious metal, few are intact and almost none have inscriptions as part of their hilt decoration. The Langeid sword may therefore be considered quite unique. It was unearthed during the archaeological excavation of a burial ground at Langeid in Setesdalen valley in 2011. The sword was found together with a large broadaxe buried in a grave that appeared to have been marked by a roof bearing structure supported by corner posts. The grave can be dated to the first half of the 11th century. The Langeid sword is of a type that was unknown to the esteemed sword researcher Jan Petersen when he presented his thesis in 1919. Swords of Petersen’s type Æ have a similar curving hilt design, but lack the precious metal inlays and the end of the pommel. The Langeid sword is in quite a different category of swords, being the ornamental and prestigious role model for the simpler swords of type Æ. Another example of a sword similar to the Langeid sword has been found at Ål in Buskerud, we have at least two from Denmark, one from Suontaka in Finland and several from the Baltic region. It is still a mystery as to exactly what the symbols on the sword’s hilt tell us. Many of them clearly bear a Christian message with different variants of the cross. The Latin letters are among the most complex to interpret, but one may suspect that they are meaningful abbreviations with a Christian message. They could be anything from Bible verses to worship of Christ in Greek or Latin, somewhat equivalent to Christograms. A cross or X may stand for Xristos (Christ). R occurs in several places and may stand for Rex (king). H only appears once, and its meaning is rather uncertain. An E sign appears in several places, both inverted and not, but also lying like a W. The meaning of the E sign is unclear. A sign that at first sight might remind one of a rune is now considered to be possibly a stylized S. This sign appears, for example, at the top of the pommel in combination with a hand holding a cross. The hand may represent the hand of Jesus or God. The cross in the hand combined with the S sign can, if interpreted generously, be read as Xristos Salvator (Christ the Saviour), but would then represent a mixture of Greek and Latin. Symmetry in the rendering of characters appears to have been important. Letters are even written in inverted form in many places in an effort to achieve this, but it is not carried through consistently. Close-up photo of the pommel. Inlays of gold wire makes up the central line in each symbol. The gold is framed by a copper wire that is now black. All the intermediate surfaces have been filled in with parallel silver wires. At the top a hand holding a cross is visible. Photo: Vegard Vike, Museum of Cultural History, UiO. The inscription and decoration on the hilt take the form of fine threads of silver, copper and gold. The components of the hilt have first been forged of iron, and the surface of the iron has then been chiselled with tight rows of parallel lines. These lines are cut in three different directions, creating a cross-grained surface very like the surface of a file. This provided a good mechanical means of fastening for the threads of precious metal when these were set on top and hammered in. The decorative lines and symbols have gold as the main metal, and around each gold figure a frame of copper thread has been placed. Finally, threads of silver have been inserted to fill in the empty space between the figures and form a background. The craftsman has apparently been very thrifty with the gold, since this is so thinly laid that the tips of the cross-grained iron protrude through the coating of gold. The grip also has a covering of precious metal, but in this case around an organic core, probably of wood. The perfectly preserved covering consists of an encirclement of silver thread, alternating between twisted and straight threads. Each end of the grip finishes with thicker clusters of twisted silver thread. Swords with hilts that curve away from the grip tend to have quite short grips in the Viking era, and the grip on the Langeid sword is one of the shortest we know of, at only 6.5 cm. This short grip only accommodates three fingers, so that the little finger must be held partly on the pommel, alternatively the index finger and thumb is held forward onto the cross guard. Despite this seemingly impractical feature of the short grip, this type of sword was nevertheless completely serviceable in combat when the user was accustomed to it. The silver thread surrounding the grip was the only precious metal visible when the sword was discovered. More detailed x-ray examinations revealed that there was also precious metal on the rest of the hilt, beneath a hard covering of iron corrosion. Normally, micro-sandblasting is the quickest and gentlest way of cleaning iron objects, but in this case it would have caused irreparable damage to the thin, distorted but still polished precious metal coating. A particularly extensive and painstaking method was therefore chosen, namely micro-chiselling under a stereo microscope. Altogether more than 400 hours were spent on the conservation work, almost all of which was devoted to cleaning the hilt. Only minimal conservation work was performed on the sword blade, mainly to secure and stabilize the remains of the sheath. On X-ray it is possible to glimpse rows of signs along the sword blade, but these are very unclear and difficult to define. X-ray photo: Vegard Vike, Museum of Cultural History, UiO. X-ray examinations of the sword blade have revealed inscriptions or symbols there also – fashioned in ferroalloy, not precious metal as on the hilt. It is possible to perceive a row of symbols on both sides of the blade, superimposed on each other on the X-ray. This is difficult to discern on conventional x-ray as the blade is completely corroded. Further cleaning and investigation is required if we are to discover more details about the blade inscriptions. Petersen, Jan (1919): De norske vikingesverd en typologisk-kronologisk studie over vikingetidens vaaben. Jacob Dybwad, Kristiania. Wenn, Camilla, Z. Glørstad, K. Loftsgarden (2016): Rapport arkeologisk utgravning Rv.9 Krokå – Langeid, del II: gravfelt fra vikingtid. Wenn, Camilla, K. Loftsgarden (2012): Gravene ved Langeid - Foreløpige resultater fra en arkeologisk utgraving. Nicolay 117: 23–31. 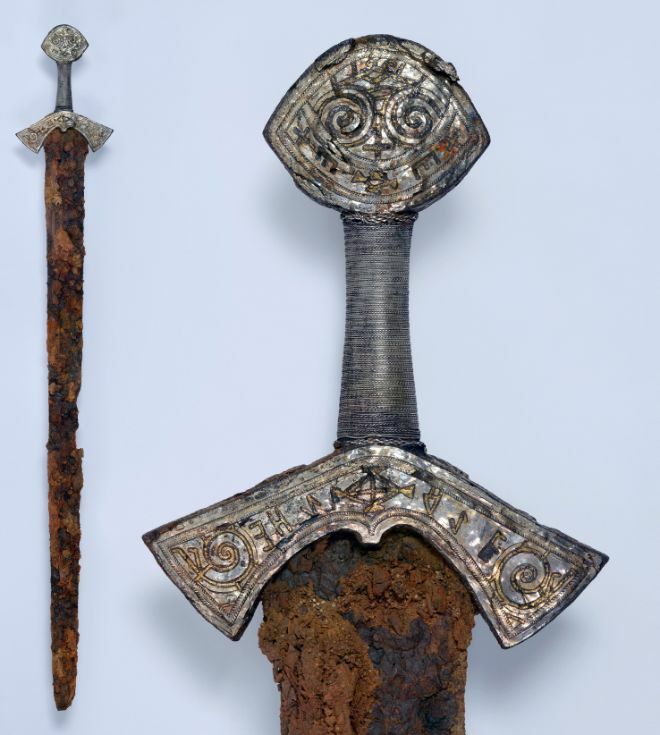 More pictures of the Langeid sword (the museum’s photo database). By Vegard Vike, archaeological conservator.